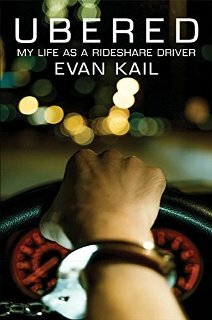 His family’s wealth has evaporated, and now serendipity is all Evan Kail can salvage from his riches to rags nightmare. He’s been chasing a screenwriting dream, and he’s put everything on the line to attain it. So when a new phenomenon called “Rideshare” enters his market in Minneapolis, Kail seeks an opportunity which he believes will allow time to pursue his calling. His only item of value, a BMW sports car purchased in the glory days of wealth, affords him a down payment on a used luxury sedan. Before Kail knows it, he’s a soldier in the trenches of a tech revolution, and he’s in way over his head. Ubered is a journey through the jungles of a wild mind in an even wilder adventure driving full-time for Uber and Lyft. Over the course of one year, Kail dances with all hosts of personalities, battles all sorts of scenarios, and struggles to realize what it means to be a contractor, not an employee. Prepare for the craziest year of Kail’s young life, one that would leave him grappling to understand the very meaning of fate and all he thought was sacred. The following is an entirely true account of my life while working full time as a rideshare driver in the Minneapolis/St. Paul area, starting in November of 2014. Both Uber and Lyft vary considerably from market to market, and at no point during the course of this book did my market offer the “POOL,” “EATS,” or “SELECT” services. Additionally, some of the names of my passengers have been changed, while others have not. "Humanmade is simply an awesome writer's resource! I highly recommend their website to all authors wanting a broader audience. In fact, I was so impressed with their website that I added it to the bonus materials in my latest nonfiction, How to Find us on Facebook: An Essential Guide for Indie Authors."